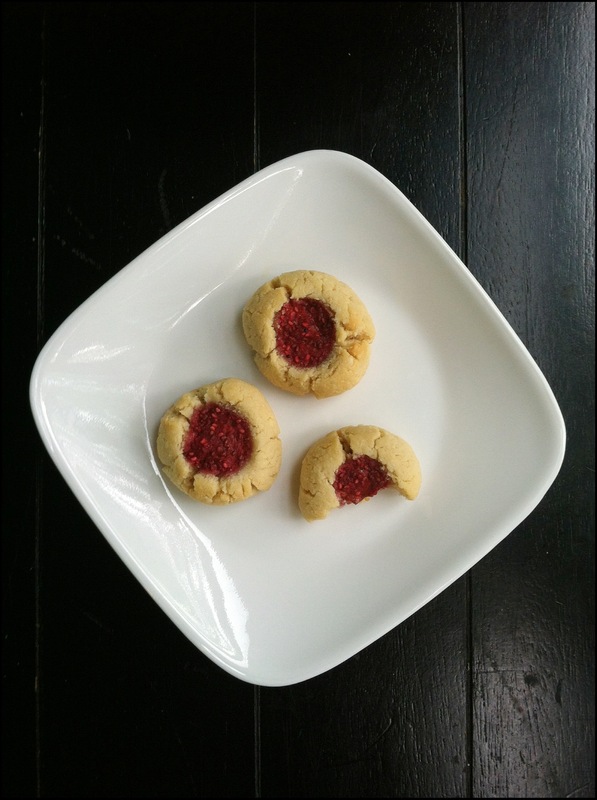 Almond Thumbprint Cookies with Raspberry Chia Jam. | Eat More Plants. 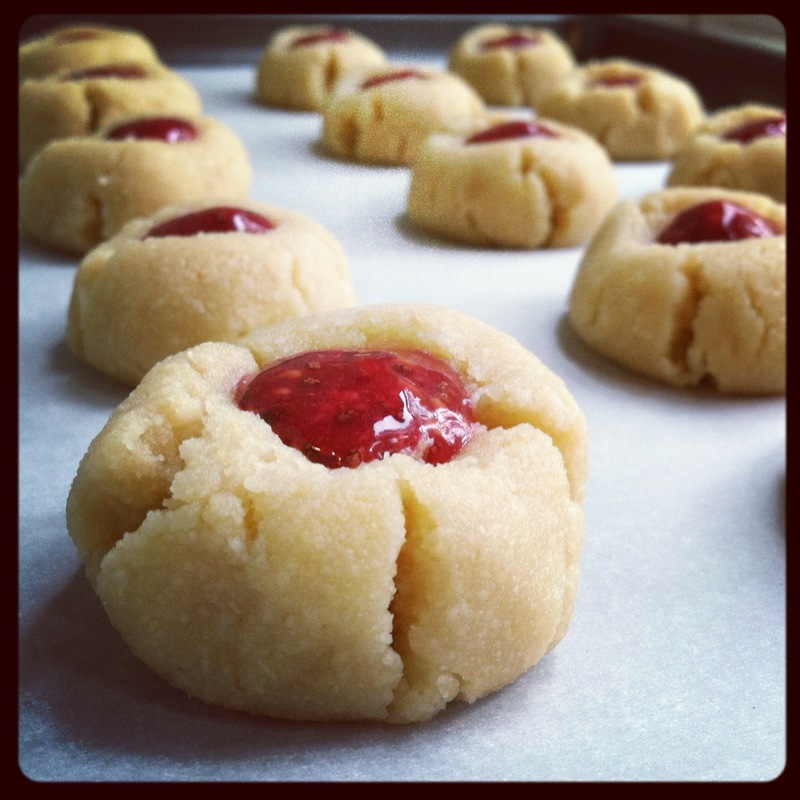 Almond Thumbprint Cookies with Raspberry Chia Jam. I loved making thumbprint cookies as a kid. Something so fun about making the little holes and filling them with sweet jam. 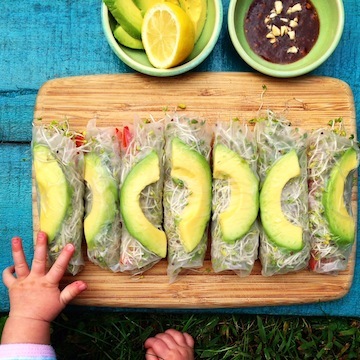 I was really happy to come across a veganized recipe for them on one of my favorite food blogs, the detoxinista. Very easy to make, and a bonus if you like chia jam because you’ll be left with some extra! I have tons of raspberries in my fridge right now, more than humanly possible to eat, so I was glad to double the chia jam recipe and use a full cup of berries. Feel free to halve the jam recipe if you don’t think you’ll use the extra jam. Let sit for 15-20 minutes so that the chia seeds absorb the liquid. Blend for 1 minute in a blender or food processor to create a more jelly-like texture. Set aside until your cookies are ready to fill. Cream the oil, maple syrup and both extract with a hand mixer on high speed until light, fluffy and smooth. Add almond meal and salt and mix well until you have formed a dough. Roll into tablespoon sized balls and place on a parchment covered baking sheet, spaced 2 inches apart. Gently press your thumb down into the center to create a well in each cookie. The outside will crack as you press down but you can push it back together, no worries. Fill each well with chia jelly. Bake 8-10 minutes until slightly golden on top. Let cool for a few minutes on your baking sheet and then move to a wire rack to cool completely. Great recipe! I love how you used chia seeds in the jam. Can’t wait to try this! Thanks! Chia seeds work so well as a thickening agent. I know the texture isn’t everyones cup of tea but I love it! Plus, you can’t beat the nutritional value…anywhere I can add them in, I’m glad to! I was in Whole Foods this a.m. and noticed a raspberry-chia dip. I find this curious, because I really haven’t used chia seeds at all for cooking. Are the chia seeds ground, and do they thicken the jam without cooking? I know, I read your recipe, but I just want to make sure. Thanks. They aren’t ground, in fact, I don’t think I ever seen them ground! They are one seed that your body can readily absorb the nutrients from without grinding or pre-soaking. You will see them gel together as you leave the jam mixture soaking and you’ll really be able to tell after you blend it for a minute. A raspberry chia dip sounds delicious! !